An annual one-of-a-kind Emergency Medical Services (EMS) event to be held in Boca Raton August 8th – 11th. August 2, 2017 – For over a decade, Pinnacle has been the EMS leadership event of the year for EMS executives, chiefs, and managers. These people meet to share experiences and attend sessions on a wide variety of issues facing Emergency Medical Services today. Highlights include announcement of the Pinnacle Leadership Award recipient and the exhibit hall, featuring companies who are focused on providing product and service solutions to the EMS sector. Wisconsin based Aladtec (booth #74) will be offering guided demos of their popular online employee scheduling and workforce management system. This system was created for the Public Safety sector. Many EMS agencies need to juggle shifts for employees; Aladtec easily handles these complex 24/7 shift rotations, along with many other challenging administrative tasks, which are commonplace in EMS and other first responder departments. Aladtec customers indicate they receive many benefits after implementing the system. These include increasing agency efficiency, saving time, saving money, improving morale, and reducing human error. These benefits are vital for Public Safety Agencies. Over 1,900 organizations throughout North America subscribe to Aladtec’s online employee scheduling and workforce management software, with over 118,000 people using the system. During Pinnacle 2017, Aladtec staff look forward to seeing many of their customers from around the country. 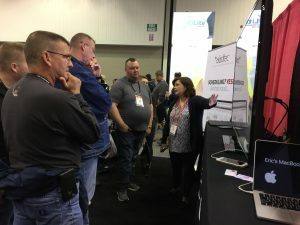 They will also offer guided system demonstrations to other attendees and encourage them to sign up for a free 14-day Aladtec “try-it” demo at their booth (#74).